Fresh pears make up the filling for this yummy pear pie, along with some lemon juice, sugar, and cinnamon. This is an excellent way to use fresh pears. 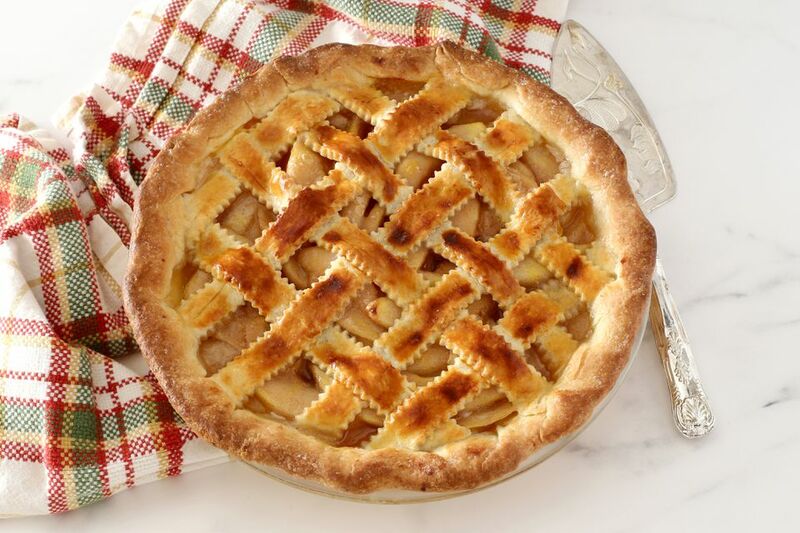 Think about adding this flavorful and attractive pear pie to your holiday dessert menu. This recipe includes instructions for a rich, all-butter pie pastry shell, but you can easily use a refrigerated, premade pie dough shell or your favorite pastry recipe. If you do not care to make a lattice crust, then top it with a conventional top pie crust. Make sure to cut vents in it to allow steam to escape and brush it with an egg wash before baking. Combine the 2 1/2 cups of flour, 2 teaspoons of sugar, and 3/4 teaspoon of salt in a food processor. Pulse to blend thoroughly. Add half of the butter pieces and pulse 6 times. Add the remaining butter and pulse 6 to 8 more times. The mixture should look crumbly with larger pea-size pieces of butter visible. Add about 7 tablespoons of ice water and pulse a few times. Add more water, about 1 teaspoon at a time, until the dough is moist enough to hold together when squeezed. Turn the dough out onto a floured surface. Press the dough together and shape it into 2 flattened discs. Do not knead more than necessary to bring it together into a dough. Wrap the discs in plastic wrap and refrigerate for about 30 to 45 minutes. Take one disc of dough out of the refrigerator. On a lightly floured surface, roll the dough into a circle about 2 inches larger than the upside-down pie plate. Fit the dough into the pie plate and leave the overhang. Peel the pears and cut them in half lengthwise. Remove the cores and fibers and slice them thinly. Toss them in a bowl with the lemon zest and juice. Turn the sliced pears into the pie crust. Combine 1 cup of sugar, 1/4 cup of flour, cinnamon, and 1/8 teaspoon of salt; sprinkle over the pears. Dot with the cut-up 2 tablespoons of butter. Remove the remaining disc of dough from the refrigerator. On the lightly floured surface, roll it out and cut it into strips about 3/4-inch in width. Arrange five dough strips across the top of the filling. Weave the strips in a criss-cross pattern over the top of the pie. Fold every other strip back and place a new strip at a right angle to the first set. To create the latticework, unfold the strips you folded and fold the alternate strips. Place another new strip over the strips and unfold the folded strips again. Repeat until you have covered the pie with "woven" strips of dough. Cut any long ends and wrap the overhang over the ends of the strips. Flute as desired. Combine the egg and 1 tablespoon of milk and whisk until well blended. Brush the egg wash lightly over the lattice strips. Avoid the edge for now. Set the egg wash aside. Cover the fluted edge of pie with a strip of foil or pie shield. Bake the pie at 425 F for 15 minutes. Remove pie shield and brush the egg wash over the crust edge. Reduce the oven temperature to 375 and bake the pie for about 20 to 25 minutes longer, or until the pears are tender and the crust is golden brown. The egg wash produces a shiny, golden brown top crust. Make sure you dab it over the latticework and don't let it drip into the filling. A crumble topping is another excellent option for this pie. Cut the pie crust ingredients in half and prepare the crust, fitting it into the pie plate and crimping as desired. For the crumb topping, combine 3/4 cup of flour with 3/4 cup of brown sugar, 1/4 teaspoon of salt, 8 tablespoons of butter which has been cut into small pieces, and 2/3 cup of rolled oats. Work the mixture together with fingers or a pastry blender and then sprinkle the crumbs over the pie filling. Bake as directed.